This series of books follows a young girl who has had a great loss. She learns a lot about herself, endurance, sacrifice, trust, keeping promises and joy. Expect to learn about life on the rancho and what it was like to trade with people on the wagon trains. Strong male characters include Josefina’s father, grandfather and a friend. 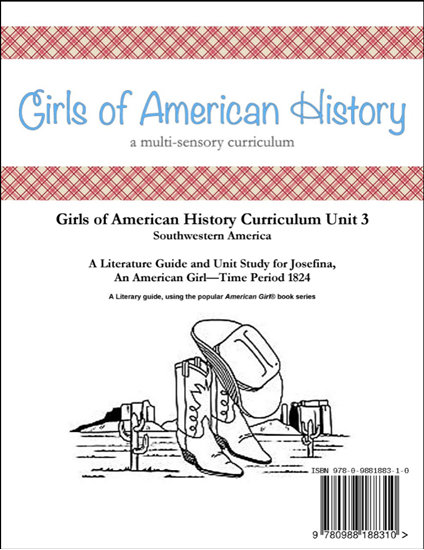 A six week unit study using the American Girl® Josefina® series books. This unit works well for studying the early 19th century, the southwestern states, the Alamo, Pueblo Indians, the Mexican American War, and so much more. Craft and field trip ideas from the time period are included in the unit to help enhance the study. All units now include spelling and vocabulary, State/Country study, Character analysis worksheets, then and now comparison worksheet, news article prep, book summary, chapter summary with drawing, and digging deeper project suggestions. This product is sent via email as a PDF file. Studying history as a family is, perhaps, the best way to learn. One of the most important parts of homeschooling is family relationship. Schooling multiple ages together with the continuity of the same subject matter for literature and history, as well as crafts and field trip experiences gives opportunities for family discussion and builds long lasting and cherished memories. The experiences practiced in multisensory learning allow each family member to participate in ways that help them understand and retain best. Brothers and sisters learn together and help each other with projects such as making a clay pot, leather stamping, having discussions about the story, historical information, as well as positive character traits such as bravery, selflessness, etc. Multisensory learning is great for every kind of learner - because each learner gets to experience learning the way they are most comfortable - but they also have the opportunity to learn through other senses. Studies and research have shown that learning material through multiple senses helps children to retain information better. Get the entire family involved learning some Spanish or making traditional cookies. This six week unit study using the American Girl® Josefina® series books is also great for doing school with an additional family or two. Get together for weekly activities or field trips, while doing the rest of the study on your own with your family. Get together at the end of the unit for a backyard fiesta of your own! **Crafts are not included in the purchase of the curriculum, but resources and instruction as to what crafts to purchase are included. Family license allows single family usage for the purchaser only. Copies are not permitted for use outside of the owner's immediate family. If you are a co-op or charter school purchasing for a single family - please make a note of the family's name and email address when ordering. Explore the history of the Nez Perce through the eyes of Kaya®, as she gallops along the Pacific Northwest, fishes on the banks of the Columbia river and learns different lessons in life. 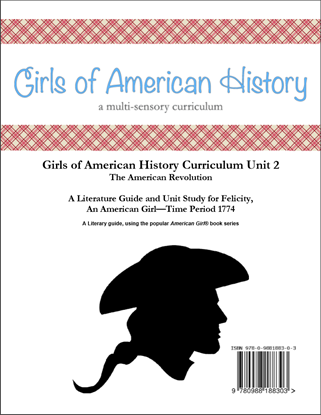 Kaya® - A six week unit study using the American Girl® Kaya® series books. 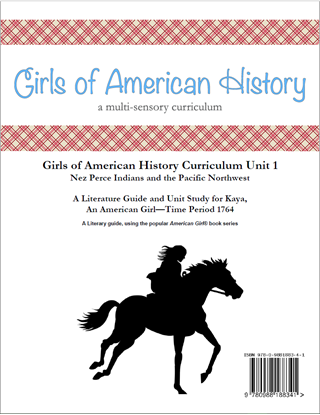 This study gives boys and girls a look into the Pacific Northwest and the Nez Perce Indians in 1764. Although this particular unit pertains to a time in our history that is prior to the exploration of the Pacific Northwest and an establishment of a real organized government, the study of the Pacific Northwest and the Nez Perce Indians is still a rich part of the history of North America. Suggestions to further the study of this time period as well as craft and field trip ideas are included in the unit to help enhance the study. All units now include spelling and vocabulary, State/Country study, Character analysis worksheets, then and now comparison worksheet, news article prep, book summary, chapter summary with drawing, and digging deeper project suggestions. This product is sent via email as a PDF file. This series of books follows a young girl and her family as they travel across land and sea. She experiences loss and confusion as she learns how to live in a new culture, gains new friendships, and accomplishments. Strong male characters include her brother and father. 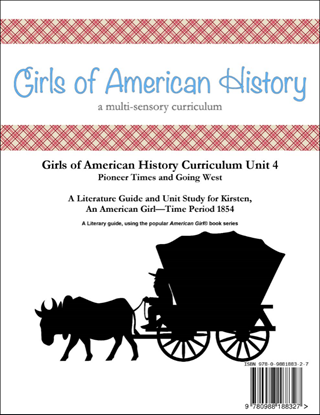 A six week unit study using the American Girl® Kirsten® series books. This study is not only about pioneer time, but includes life as a young immigrant and what life would have been like. This is a great unit to use during your study of the Oregon Trail, Immigration, the Gold Rush, Midwest America, and more. You can easily stretch your early 19th century study across both Josefina and Kirsten. Craft and field trip ideas from the time period are included in the unit to help enhance the study. All units now include spelling and vocabulary, State/Country study, Character analysis worksheets, then and now comparison worksheet, news article prep, book summary, chapter summary with drawing, and digging deeper project suggestions. This product is sent via email as a PDF file.